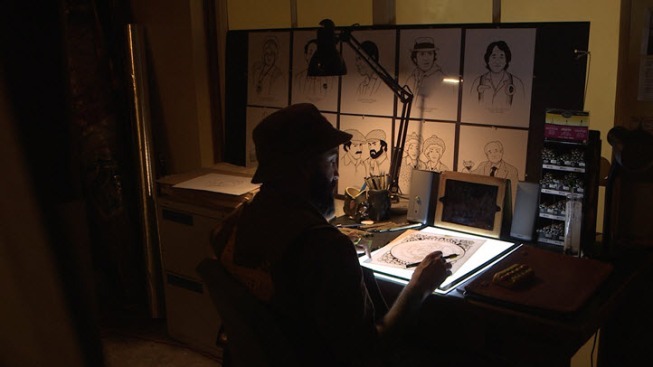 In a dimly lit room in a corner of San Francisco’s ornate city hall, artist Jeremy Fish sat beneath the beam of lamplight, sketching on a large piece of paper. His roommates included a pair of old flags, a scale model of city hall and metal filing cabinets filled with forgotten mementos of political past. Not exactly a glorious abode for the man who recently became San Francisco’s first-ever city hall artist-in-residence. “I sort of feel like it’s the room of forgotten importance,” Fish said, peering around the make-shift art grotto. San Francisco’s Arts Commission tapped the popular San Francisco artist as the city marks the 100th anniversary of City Hall this year. The commission floated the idea of Fish creating a hundred drawings to mark 100 years. “We’ve done a lot of research and I can’t find a precedent for any artist-in-residence in the past,” said the Arts Commission’s Meg Shiffler. “So Jeremy is the first official San Francisco Arts Commission Artist-in-Residence. Fish was informed that many, many people have toiled-away at city hall for years — without an office. But eventually city hall’s building manager offered Fish use of a now-abandoned phone room, which still contained a single working pay phone. “I would have a phone just in case I’d need it to make some calls,” Fish said. Instead Fish accepted the offer of the storage closet, where he spends three days a week harnessing inspiration from around the building and divining it in his drawings. One of his images was inspired by a large medallion on the rotunda ceiling showing a Greek man wielding a sword. Only in Fish’s version, the man’s weapon of choice is a cell phone. Fish said the piece is a nod to the current influence of technology in San Francisco, and its lure for thousands of techies who have moved to the city. Fish is a big fan of city hall — the architecture, the hustle-and-bustle of city business and the ubiquitous weddings. “There’s like a record number of weddings here a day,” Fish observed. He rattled off other city hall statistics, such as city hall has the third largest dome structure in the country and is taller than the U.S. Capitol in Washington D.C. While Fish has found inspiration in the architecture he soon plans to also draw inspiration by sitting in on city meetings -- though he was a bit dubious about the experience. Fish’s drawings are a liberal take on city hall life, as well as the city’s well-worn characters. San Francisco’s famous late twins Vivian and Marian Brown appear in a drawing. So does Herb Caen and Emperor Norton -- with one noted embellishment. Fish’s Norton indeed reveals a city hall chest tattoo, along with a birthday acknowledgment. In another drawing, a sleeping California bear, bears city hall on his back. Fish’s 100 drawings will appear on street banners and in a city hall art show in November, a month before the building’s actual anniversary date. Fish said the looming deadline is causing some anxiety. But mostly, the pressure comes from wanting to set a good precedent as the city hall's first artist-in-residence.